These Scientists Started Growing Cotton - On The Moon! These Scientists Started Growing Cotton – On The Moon! The moon has been a fascination of mankind’s for thousands of years. Whether for geological, astronomical, spiritual, or scientific reasons, the lonely clump of rock has been a central part of cultures and societies over the course of history. When the U.S. managed to land on the moon, it became a history-defining moment and one of the greatest achievements of our species in recent history. However, as we have moved steadily forward into the brave new future, other countries have started extending their interest into exploring the moon and recently, a Chinese rover that landed on the moon planted something other than a flag. The Chinese moon lander known as Chang’e 4 successfully managed to land on the far side of the moon at the beginning of this month. 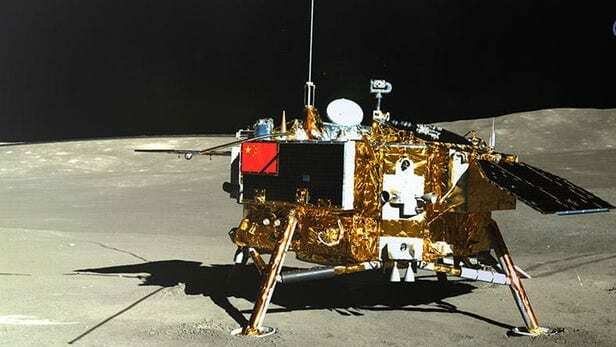 The lander had a rover on board that was called Jade Rabbit 2 which had a very special mission. Rather than only taking pictures or rock samples, Jade Rabbit 2 was designed with the purpose of being the first ‘thing’ to grow plants on the moon! The Chinese scientists who designed the rover also created a small, 18-centimeter greenhouse with the purpose of housing seedlings for growth on the moon. The initial goal of the scientists from the Institute of Advanced Technology at Chongqing University was to determine whether or not plants could survive on low-gravity surfaces that are exposed to high levels of radiation. The location chosen for their experiment was the South Pole – Aitken Basin – which is currently the largest crater impact in our solar system. The plants chosen for the experiment were cotton, potatoes, and rock cress and after nine days, sprouts began to appear – a sign that the hostile environment was able to support life if even on a small scale at first. These results are very promising for future space exploration as it means that growing plants for sustenance and survival on planets like Mars or in deep space is viable in the future.